The new version 1.0.3366-1 of Cydia is ready. some of my long term performance plans are 'hitting pay dirt', and Cydia is much faster than it was before; that said, it isn't done yet: there's one more thing that I think is going to make a huge difference that isn't even in there yet but should be for the final release. MobileTerminal is a terminal emulator application for the iPad and iPhone. The version of MobileTerminal that is available in Cydia doesn't work with iPhone iOS 4.x and iOS 5.x. However there are beta versions that do work, but aren't on Cydia because they are still in beta stages. This tutorial will show you step-by-step how to install MobileTerminal on iPhone with iOS 4.x and iOS 5.x (tutorial for iPad is here). If you have old version of MobileTerminal installed - uninstall it in Cydia (Search - MobileTerminal - Remove). MobileTerminal is a terminal emulator application for the iPad and iPhone. The version of MobileTerminal that is available in Cydia doesn't work with iPad iOS 3.2.2, iOS 4.x and iOS 5.x. However there are beta versions that do work, but aren't on Cydia because they are still in beta stages. This tutorial will show you step-by-step how to install MobileTerminal on iPad (tutorial for iPhone is here). If you have old version of MobileTerminal installed - uninstall it in Cydia (Search - MobileTerminal - Remove). It seams that hackers have had their hands on the iOS 4.2 beta 3 for iPad. But, as we know, there is no official jailbreak for it. Recently the well-known iOS hacker posted aт interesting picture in Tweeter. 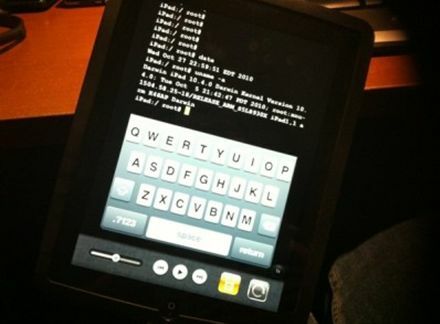 The shot depicts an iPad running MobileTerminal, a jailbreak application, which gives users full access to the terminal command line interface. But it looks strange, because it means that the hackers missed the beta 4, which should be released this past Tuesday, according to the Apple’s schedule. This could signal that Apple may skip beta 4 altogether and go straight to a GM build sometime next week. This is quite simple. If you did a jailbreak on your iPhone you need to change the default password. Why? Because hackers can access your phone, read your mail, sms, download other data. The second reason is because there are already several viruses (worms) that use these default passwords. Here's a quick step-by-step tutorial. If you don't have MobileTerminal application installed: for 4.х and 5.x firmwares we have a good step-by-step tutorial, for 3.x just run Cydia, search for MobileTerminal and install. Type passwd and press return. Enter the default user password alpine and press return. Enter a new password and press return. Enter a new password again and press return. Congratulations, you changed it for default mobile user. Let's do the same for root user. Login as root user: type su root and press return. The passwords are now changed, and your jailbroken iPhone or iPod Touch is now a bit more secure than it was before and less vulnerable to the worm detected recently. Why would you need T9 on iPhone? Well if you still want it, it will be avaliable in Cydia soon. Enable T9 in keyboard settings. You probably know about latest iPhone’s security issue. The good news is that there is a solution to fix it. Screenshots themselves actually get written to /var/mobile/Library/Caches/Snapshots. So these commands delete this folder and symlink it to /dev/null, so the screenshots don’t get written to disk. The side effect to this is that when resuming an application, you’ll get the default screen in the zoom-in effect. Once the application resumes, however, you’ll have your application screen back. For example, your mail application will always zoom to the front as if you had an empty inbox, but will quickly correct itself once the application resumes.